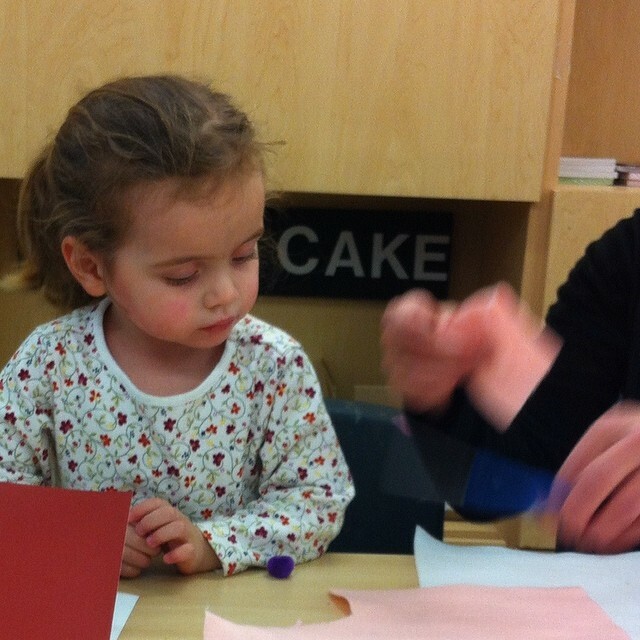 February 8, 2014 ~ Craft Stores | Whatever! Ashlin got to go to her first craft at Michael’s today. She was very uncertain at first. Crying, not wanting to be left with the worker. So, I stayed with her for a bit, helped her cut the pieces out of the felt. Eventually, she didn’t need me to stand so close. I slowly backed away, then told them I needed to go get some yarn, and would be right back. I calmly walked out of the room, peeked in the window to make sure she was ok. She was. I’m not even sure she noticed I walked out. Yay! As they finished up the “sweet card” so quickly, the worker pulled out the loom and they made a rubber band bracelet. Ashlin hasn’t had much scissor experience yet, but she rocked the glue stick! She was also very considerate, making sure to pick up all the dropped rubber bands right away. The worker said she could come back any time! That she wasn’t sure how it would turn out, especially with the tears and reluctance at first, but that with that warm-up time, Ashlin did great. After we finished up at Michael’s we headed to Joann, I needed some material and patches for the pants that Teagan’s worn through at the knee – left knee on all! – on six pairs of jeans. Six. Granted, one is a 3T, but one is a new pair of 5T’s. Gah. She’s so rough on her pants. I had found this awesome way to use the iron-on patches, so that they should stay, and also not look so iron-on. So, eventually found the patches, the wonder under, floss and needles. The material was the hardest bit, not easy to find interesting material that has flowers or cute things at about 1.5 inch. Eventually I ended up with quilting quarters. 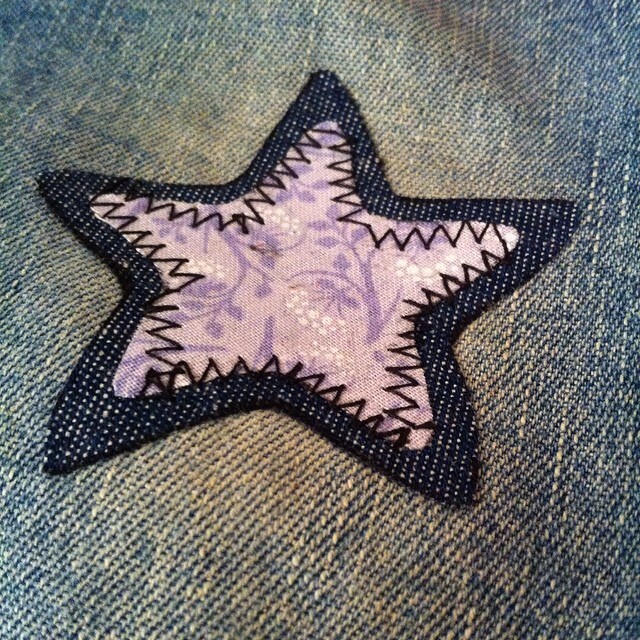 I need a LOT more practice with the machine, and well, sewing in general. My first attempt was the best, but still left a lot to be desired. Sewing is hard! The second, even with pulling out the stitches four times, is a bit sad. But the third wasn’t too bad. Good enough for the girls anyway! I’ll do the hand-stitching tomorrow. Maybe. Soon though, Teagan needs those jeans! Awesome on Ashlin’s craft adventure. She’ll be asking to go back and push you out the door. HA HA Love the way you ‘patched’ the jeans. Made a stylish statement while making a necessary repair. Good job. Thanks!! 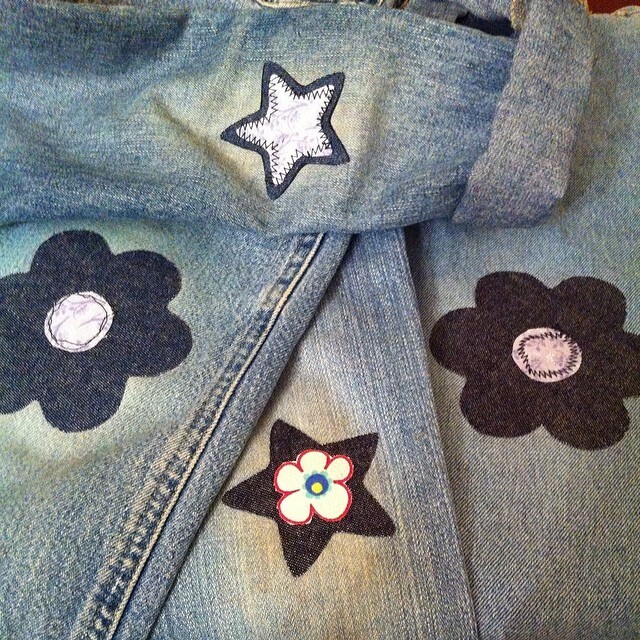 I was really psyched when I saw the suggestion for patch “embellishments” on google. I remember the plan square patches growing up. Teagan giggled when I showed her the first one. I just need to hand stitch a bit so the patches actually stay on. I’ll get there soon enough! Ash ended up having such a good time at her “special because older sister is at dance class” craft time. She said she wants to go again. I need to see if Joann has a different schedule, Michael’s is usually only once a month. I haven’t done any of the grown-up craft classes, though I have friends that have done the knitting and crochet classes, also the cake decorating classes. :) I wonder if they take hubbys? LOL Really he is super when he does end up with me in Michael’s/AC Moore, etc…He is like a kid…finding things and then finding me to see what he has found. HA HA..